'Miracle On 34th Street': An Old Holiday Movie For Modern Times : 13.7: Cosmos And Culture What makes Miracle on 34th Street so delightful is the way it constantly turns the question of belief vs. evidence into a question about our most essential and human values, says blogger Adam Frank. 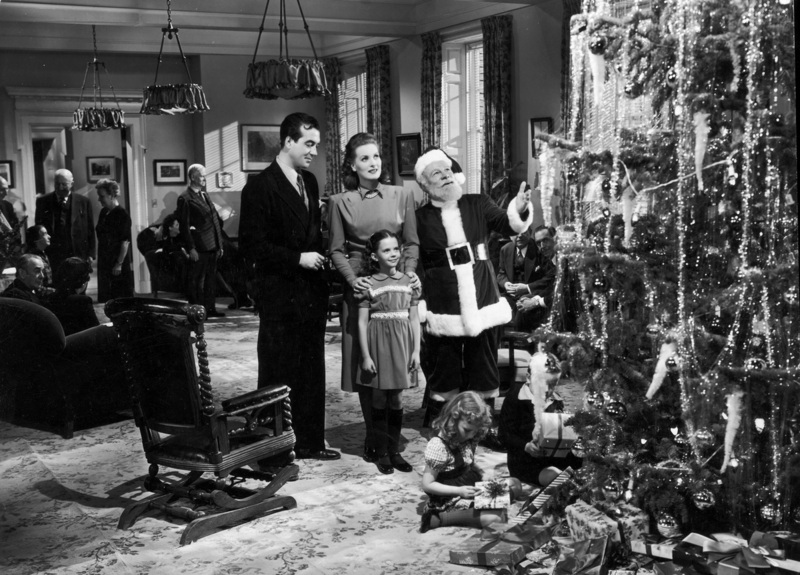 (Left to right) Actors John Payne, Maureen O'Hara, Edmund Gwenn, and young Natalie Wood stand before a Christmas tree in a still from director George Seaton's film, Miracle on 34th Street. So, it's that time again. For the next month, we're all in for a whole mess of holiday-themed music and movies. This wouldn't be a bad thing if it weren't so deeply joined with the endless commercialism that now defines the season. Retreating from this commercialism is exactly why I watch Miracle on 34th Street each year, as I did this Thanksgiving. To me, it's one of the most charming holiday movies ever made. But this time round, with all that's going on, I found something remarkably renewing about this old movie's message and its perspective. First, let's get something straight. I'm talking about the original version of the film. I'm sure the others are OK, but the first thing that struck me watching the movie again was its vintage: 1947. This was just two years after the United States emerged from the long nightmare of World War II. America had only just defeated the horror that was (and still is) the Nazis through the great sacrifice of her servicemen. The total commitment our country made to destroy the evil of fascism left us stronger and more confident than at any moment before in our nation's history. If you remember this background, then the movie's first scenes of New York circa 1947 are pretty striking. That version of America's most vibrant (and most cynical) city is the stage. That's where a most delightful contest between faith and reason takes place. I'm guessing you know the story. Kris Kringle (Edmund Gwenn) shows up in town because he's gotten pretty sad about what has happened to Christmas. He soon finds himself hired as Macy's Santa Claus by the earnest Doris Walker (Maureen O'Hara). Walker is a single mom determined to raise her daughter Susan (Natalie Wood) to see the world only through the cool light of reason: no fantasy, no make-believe — and no Santa Claus. But, of course, there is a handsome young lawyer named Fred Gailey (John Payne) living next door who is smitten with both the mother and daughter — and is all about belief in the imagination and in ideals. To make a not-so-long story shorter (and not caring about spoilers since, hey, the film is 70 years old), Kringle ends up in danger of being committed for his insistence that he's Santa Claus. It's up to Gailey to win Kringle's case in a court of law. What makes Miracle on 34th Street so delightful is the way it constantly turns the question of belief vs. evidence (an issue we often deal with here at 13.7) into a question about our most essential and human values. Best of all, it does this with a jaundiced eye that admits the full spectrum of human folly. The judge assigned to the case wants do the right thing by both reason and the law, even if that means committing Kringle. But his cigar-chomping political advisor lets him know, in no uncertain terms, that jailing Santa Claus will end the judge's political career. So begins the trial of the century, in which, somehow, reason and belief must be made compatible. But what the movie really tells us is that what's up for grabs is belief in what is best in ourselves. The whole argument about that guy with the beard and reindeer is, we're told, really about our own goodness. At one point, Fred tells Doris he's OK getting fired from his current law firm for taking Kris Kringle's case. He will just start his own firm instead. Doris disapproving asks what kind cases he thinks he'll get. Fred responds: "Oh, probably other people who are being pushed around like Kris. That's the only fun in law anyway." This leads to an argument between the couple about the intangibles that Doris thinks reason and common sense show to be of lesser value. Fred responds: "It's not just Kris that's on trial, it's everything he stands for. It's kindness and joy and love and all the other intangibles." The trial closes when a bunch of wisecracking postal workers realize they can dump their bags of "Dear Santa" letters at the courthouse. That's when a despondent Fred, who is sure he is about to lose, realizes the delivery serves as proof that Kris must be the one-and-only Santa Claus. That, too, is a telling moment for me. Via the "Post Office Department," it's the U.S. government, so purposely maligned now, which becomes the authority confirming Kringle's identity. It's refreshing to see the movie make this stand for the power of our shared institutions, while never dropping its real-politic snark about the reality of politics. We could use some of that balance right now. So, yeah, call me a sucker but I fall for Miracle on 34th Street every time. This year, however — with its sweet balance of belief, reason and sarcasm — I was all in.